I put that fella in left and he can't field now, somebody else would use him maybe, but I can't. So I wait, and then my big fella gets hurt because he's goin' at half-speed and he's got to bunt once in a while because he can't always swing from his heels. Especially when he hits the ball to either side of the other fella he's sure to get on because nobody can catch him. But he wants to hit now and I give him his chance to play center and he does me a good job because he's a strong fella. But some fellas don't know about getting a bat with a thick handle like that Chicago fella does. He knows when you get it on the fists your muscle ain't worth a damn. But do you think these fellas understand that? Casey had trouble with names. He could remember a great deal about a pitcher's pitches and which of them a hitter liked to chase, but names were a problem. For the record: the first fella above was Bob Cerv; the second, Mickey Mantle; the third, the opposing pitcher; the "he" that wants to hit now is Cerv again; the Chicago fella is Nellie Fox. I continued on to 1956. The Indians had the best starting pitcher in the American League that year in Early Wynn. They also had the second best starting pitcher, Score. They had the fourth-best starting pitcher in Bob Lemon. That sounds like the beginning of a heck of a pitching staff, and indeed, the Indians led the league in just about every pitching category by a fairly wide margin. You could say that in Wynn, Score, and Lemon, they had the equivalent of having CC Sabathia, Derek Lowe, and A.J. Burnett today. Of course, the Indians won the pennant, and  wait, that's not right. The Yankees beat the Indians to the pennant by nine games because although they allowed 50 more runs on the season, they outscored the Indians by 145 runs. Even though the Yankees had a pitching staff composed of Whitey Ford and nine guys who Stengel would start at random, it turns out that a lineup of Yogi Berra, Moose Skowron, Gil McDougald, Hank Bauer, and Mickey Mantle can solve all kinds of pitching problems. Yes, I'm on again about Nick Swisher and Mark Teixeira, and yes, I will stop now  for today. It has been a strange year for the Baseball Writers Association  they got all the major calls right. You'd have to do the research to figure out when the last time that happened, or why Dustin Pedroia got an MVP for having a Derek Jeter year when Derek Jeter was passed over twice for doing the same thing, but that's a subject for another time. I suppose we could argue with the voters about their strange love for Justin Morneau, who already picked up an award for an unremarkable year by first-base standards and received second-place consideration for a year that was, in context, about its equal. I suppose that "he's the best of an underpowered lot" is a justification for giving Morneau extra credit, though it's really more of an indictment of Twins management than a positive for Morneau. He stands out because of who he plays for, but on a better team he would be Norm Cash or Gil Hodges or Kent Hrbek  a good bat, but not anyone you might confuse with the MVP award. Standing him up in the middle of a desert doesn't make him any better, or more heroic, only a more attractive magnet for the sympathies of sentimental sportswriters. It should be noticed, however, they can't see the forest for that one lonely cactus, who proves not to be all that loney: Morneau's RBI total is wholly do to the presence of Joe Mauer in the lineup with him. No Mauer, no hero opportunities for Morneau, no opportunities period. Yet somehow Mauer finishes about 70 points behind his teammate. Once again, they got the horse and the cart confused. I was so worked up over the possibility of the Yankees backing off on Mark Teixeira that I neglected to mention that Darrell Rasner has exited the Yankees. He is now with the Tohoku Rakuten Golden Eagles of the Japanese Pacific League. The Yankees picked up a cool $1 million from the Eagles for Rasner's rights. Rasner's 6.02 ERA, winless second half doomed him with the Yankees, not that his first half was all that great either. Given that the Nats simply gave Rasner away, the Yankees perhaps got more out of him than could have been expected. There are still the makings of a decent No. 5 starter in Rasner, though he never had the stuff to make good location work for him. Being around the plate meant low walk totals  though not low enough  and a lot of home runs. Durability issues also meant you couldn't just pencil him into a rotation spot. All that being said, if given the chance, he'd probably put together a league-average 150 innings one year for some team in the fifth spot. But every organization has about ten pitchers like Rasner, so there is no incentive to trade for him, and thus Japan. Pitchers like Rasner function as canaries in your pitching coal mine. If your team feels confident giving them away, it feels like it has something better than "reliably mediocre" on tap. We'll see what that means for the Yankees. When you have had the great fortune to write for the public for as long as I have, you also have the privilege of bonding with your readers over the things you write about. Over time, I've made some good friends that way. Many of you have written me about baseball, of course. A few more have responded to something I've written about movies, history, comic books, music, and politics. Some of you have gone even further and have entrusted me with details about your family, your work, the ups and downs of your lives. One of the things we've had to bond over is cancer. As you know, I've had two distinct forms of cancer, and have been lucky enough to get away with it so far. Both times, so many of you took a moment out of your day to let me know that you cared if I lived, and I continue to receive good wishes on my health nearly every day. I have a little idea of what Lou Gehrig felt like when he said that he was the luckiest man on the face of the Earth. Along with my loved ones, your support has been one of the great blessings of my life. I'm hoping today we can share that blessing with someone else. One of the people I've come to know though this column is Rich Faber . Rich is a talented illustrator and all-around sweetheart of a guy whose work has graced publications from almost all of the major comic book companies. In recent years, he's been closely involved with a very worthy publishing initiative called Kids Love Comics, dedicated to promoting childhood literacy through age-appropriate comic books. 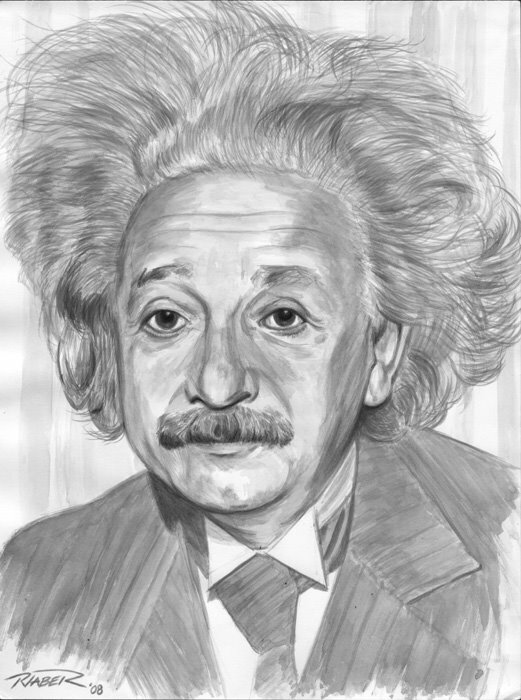 Rich is one of the most devoted Yankees fans I know, and tends to put his pen where his passion is, producing some very fine baseball illustrations, a couple of which I've included here (sure, Albert Einstein has nothing to do with baseball, but I liked it). Over time, Rich and I have gotten to know each other talking about the Yankees, the comic book industry, and even the common experience of raising very young sons  my son Clemens is three, his son is two. I regret to say that Rich and I now have knowledge of cancer in common as well. Recently, Rich's wife, Traci, was diagnosed with a form of the disease that I had  malignant melanoma. Those of you familiar with melanoma know that it is a tough fight. Fortunately, Traci has plenty of fight in her, and there is hope that these rogue cells can be licked. What is more difficult to lick is the expense of advanced medical care. While my friends have insurance, the cost of advanced treatment has outstripped the subsidy that insurance provides. As such, I wanted to share some of Rich's work with you and make you aware that he is looking to take on new commissions in order to help pay for Traci's treatment. 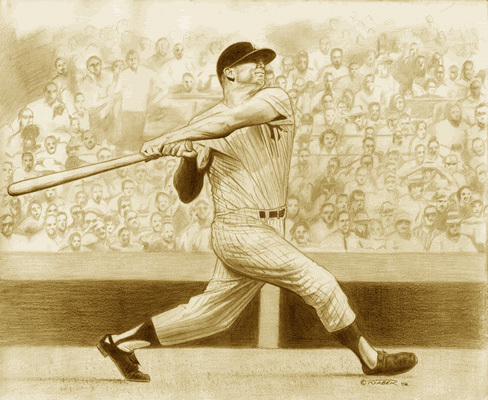 As a Yankees fan, I imagine he'd be open to creating an original piece around any player of your liking (looking at this Einstein, I can sense a very good Branch Rickey portrait in the offing), past or present. 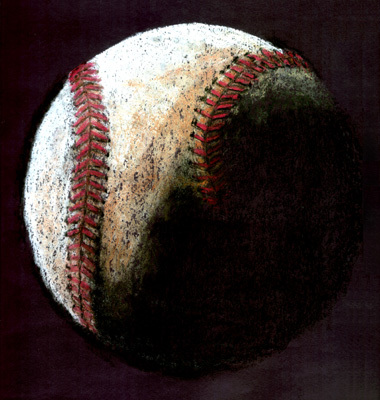 You can find more examples of his baseball art, as well as other pieces, here, and see his art blog (from whence the Einstein piece came) here. He also has many pieces of original comic book art for sale. You can contact Rich at Rich_Faber@comcast.net, and I hope you do  Christmas is coming, and nothing says, "I care" to Dad like an original drawing of Bob Shirley watching helplessly as Bobby Meacham boots a grounder. Or maybe that's just me, but you know what I mean. See the aforementioned Herb Score profile in my usual spot at Baseball Prospectus. Since last time at wholesomereading.com : Just a small update, as 2500 words on Herb Score can take a lot out of a fellow's day. Updates directly after you see this posted. Anything going on in the world? Finally, I'll be live on Montreal's Team 990 tonight at 8:25 p.m. ET with some hot stove chat. Steven Goldman's Pinstriped Bible appears weekly on YESNetwork.com. "Forging Genius," Steve's biography of Casey Stengel is available at Amazon.com and a bookstore near you, as is "Mind Game," about the intellectual conflict between the Yankees and the Red Sox. Steve's Pinstriped Blog is available weekdays on YESNetwork.com, and more Steve can be found at Baseball Prospectus Web site. Your questions, comments, suggestions welcomed at oldprofessor@wholesomereading.com. The opinions stated above are solely those of the author and should not be attributed to anyone connected in an official capacity with the YES Network.